The next decade will see a series of centenaries of key events in the history of modern Ireland, ranging from the Ulster Covenant, through the First World War and the 1916 Rising, to the foundation of the Irish and Northern Irish states. Universities Ireland, the network of university presidents and vice-chancellors on the island of Ireland, sponsored the seventh in a series of conferences to commemorate the centenary of key events in the history of modern Ireland ranging from the Ulster Covenant, through the First World War and the 1916 Rising, to the foundation of the Irish and Northern Irish States in Ulster University, York Street on Saturday 1st December 2018 under the title Reflecting on a decade of War and Revolution in Ireland 1912-1923: Votes for the people: 1918, Ireland’s first democratic election? The post-war general election of December 1918 is one of the most important events in Ireland’ modern history. Constitutional nationalism was swept away by the reborn republicanism of Sinn Féin in three of Ireland’s four provinces. It was not, however, an unvarnished triumph for the more radical Irish nationalism forged by Easter 1916 and the conscription crisis of 1918. The Unionist position in North-East Ulster was further entrenched, and the outlines of a future partitioned island became apparent from the electoral map. The aim of this conference was to explore both the high politics of the moment and its wider social context. Why did Sinn Féin triumph? How did the enfranchisement of women shape the election and the status of women in society? How did Unionists and Britain respond to the republican challenge? How was the election shaped by local and global concerns during a period of rapid revolutionary change? To address these questions, we assembled some of Ireland and Britain’s leading historians of the period. The conference speakers and talks included: Dr Diane Urquhart; Ms Claire McGing; Dr Colin Reid; Dr Helga Woggon; Lord Bew; Professor Michael Laffan; Professor Fearghal McGarry and Dr Eamon Phoenix. Full programme available here. On 18 Novemer 2017, Universities Ireland, the all-island coordinating body for Ireland’s ten universities north and south, hosted the 6th annual conference in its Decade of Centenaries series. Following on from last year’s ‘Historians on 1916’ conference, the focus of this year’s session was propaganda and mobilisation. Following the 1916 Rising, Irish politics underwent a period of profound transformation between the summer of 1916 and the winter of 1918. A major element of this was the metamorphosis of the 1916 Rising from a military failure into a successful foundation narrative of a reconstituted, republicanised, and revolutionised Sinn Féin. Much of this work was undertaken by female activists within Cuman na mBan and the wider republican movement and subsequently by released republican prisoners. Transformative Irish by-elections punctuated the period under consideration but there is much more to the transformation of Irish politics than elections in a phase which witnessed martial law, food scares, moral panics, and the constant spectre of conscription being extended to Ireland. A propaganda war was fought between advocates of constitutional and physical force nationalism as well as between recruiters for the Crown Forces and the Irish Republican Army during this period. The efforts of Irish republican activists between the capitulation of the Easter 1916 rebels and the General Election of 1918 can be viewed through the prism of mobilisation. Likewise, British wartime propaganda in the same period intensified. This was a time when Ireland was unique within the United Kingdom by virtue of its exemption from conscription. By taking the themes of mobilisation and propaganda, this conference sought to explore the shifting dynamics of Irish society and politics during a period that is often eclipsed by the prominence of the Rising at one end and the War of Independence at the other. In between these two major military events was a battle for hearts and minds, a clash of ideology, and the daily struggle of life in wartime. Socially, politically, and culturally, this year’s Universities Ireland Conference explored the complexities of this often-overlooked yet highly significant transitional phase in the long history of Ireland’s revolutionary decade. Speakers included: Dr John Borgnovo, Lecturer, University College Cork; Dr William Murphy, Lecturer, Dublin City University;Dr Aidan Beatty, Lecturer, Wayne State University, Detroit; Dr Conor Mulvagh, University College Dublin; Prof Mary McAuliffe, Assistant Professor, Gender Studies, University College Dublin; Dr Leanne Blaney, Lecturer, History, University College Dublin; Dr Daithí Ó Corráin, Lecturer, History and Geography, Dublin City University; Dr Ida Milne, IRC Marie Curie Elevate Fellow, Maynooth University and Dr Margaret Ward. All of the presentations as well as the recordings of the speakers are available below. Shane Browne – The National Volunteers: the power of political notables in mobilising the masses? On Saturday 22 October 2016, Universities Ireland, the all-island coordinating body for Ireland’s ten universities north and south, organised a major conference at the Conference and Events Venue at Dublin’s Mansion House entitled ‘Historians on 1916. Following the wave of commemorations on Ireland’s two great foundation narratives, the Easter Rising and the Somme, this conference brought together historians as practitioners to reflect on what has passed in this monumental year of commemoration. The event featured keynote addresses from leading historians from across Ireland and Britain and with panels specifically addressing class and gender. 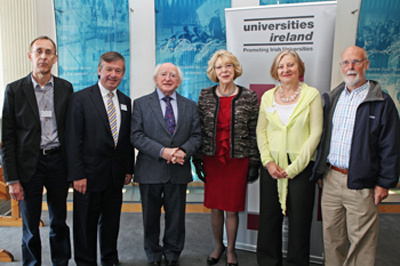 The President of Ireland, Michael D. Higgins, was the keynote speaker at the second in the series of all-island 1912-1923 conferences organised by Universities Ireland in Dublin’s Liberty Hall on 15th June. The conference was entitled ‘1912-1923: Reflecting on a decade of War and Revolution – The Cause of Labour’ and was attended by 150 people. Among the other speakers and session chairs were the General Secretary of the TUC, Frances O’Grady; Professor Ralph Darlington of the University of Salford; Professor Karen Hunt of Keele University; the author of Lockout:Dublin 1913, Padraig Yeates; the General Secretary of the ICTU, David Begg; and the general president of SIPTU, Jack O’Connor. To begin the commemoration of these events, Universities Ireland – the network of university presidents on the island of Ireland managed by the Centre for Cross Border Studies – organised a major one-day conference (co-sponsored by The Irish Times)in the Royal Hospital Kilmainham in Dublin on Saturday 23rd June under the title Reflecting on a decade of War and Revolution in Ireland 1912-1923: Historians and Public History. Over 300 academics, teachers, students, civil servants and interested members of the public attended this event. The keynote speakers was Professor Jay Winter, Charles J. Stille Professor of History at Yale University, an international authority on the First World War and its impact on the 20th century; Professor Paul Bew, Professor of Politics at Queen’s University Belfast, a noted authority on Irish and Northern Irish politics and history in the late 19th and 20th centuries; and Professor Diarmaid Ferriter, Professor of Modern History at University College Dublin, one of the country’s outstanding younger historians, noted for his extensive new insights into 20th century Irish history. There was also a session on accessing new material from the archives on the 1912-1923 period, with speakers from the Imperial War Museum in London, the National Archives of Ireland and the Public Record Office of Northern Ireland; and a panel discussion on ‘The Challenges of Commemoration in Public History’ with inputs from historians from five Irish and Northern Irish universities (and contributions from the audience).